Morse code translation is a suitably challenging programming exercise for students, and solutions in several languages are available on websites. Jack's program MorseCode (now available as a web version) translates from a string of characters to its Morse code equivalent. It both displays the Morse as dots and dashes (with a space added to represent the end of each character and a slash to represent the end of each word) and outputs it as sound. 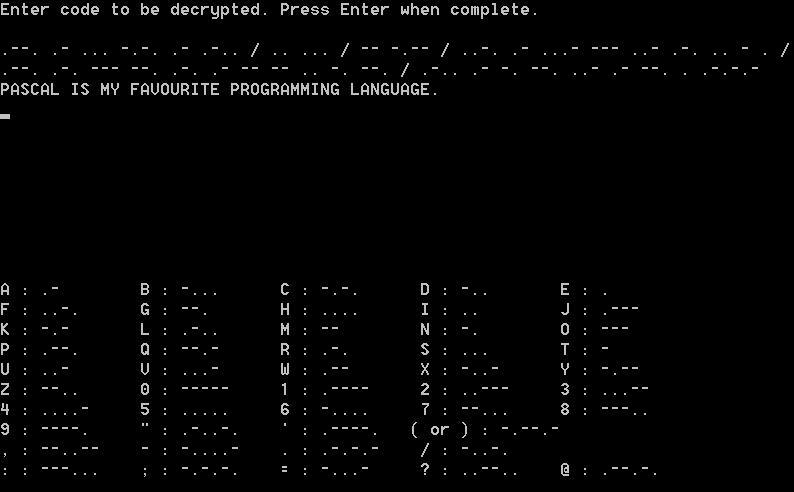 You can also input the dots and dashes with Morse punctuation and the program will translate it to the string of characters that it represents. Jack provides useful information about Morse code and also links to a the web site for further details, creating a nicely finished product. A string array stores each string of dots and dashes at the index equal to the ASCII value of the character it represents. Decryption is trickier than encryption. Jack uses string manipulation neatly to separate a Morse stream into individual character strings for decryption, which he then achieves by linearly searching the array. Helpfully, the program outputs error messages in red when the input cannot be translated. The following screenshots show a decryption, an encryption and a transmission. Compile the program using Lazarus because it the uses the Clrscr procedure in the crt unit (which not built into Delphi) or see how to download and use crt in Delphi in our Graphics tutorial. Signal := Signal + (Morse_Ascii[Ord(Passage[i])]);  // For playback with windows beep // turn Code on screen Red/Green when played? Could you write your own Morse code translator?